This week, my account fell 1.9% to the same value it had on September 23rd, while SPY rose 5.9% to its highest value since July. This was SPY’s largest weekly gain of the year so far. It seems the pundits don’t know what to make of this surge. Toby Connor predicted in late August that the market would spike above the 200-day moving average in early October before moving down again—but here we are in mid-October and SPY is still several percent lower than that. He wrote then, “This is going to be a very, very convincing rally. The tendency is going to be to buy into the media hype, that this was nothing more than a severe correction in an ongoing bull market.” Yet on October 4th he wrote, “I think we probably just saw a major turning point today. One that should mark a bottom for at least a couple of months.” Has he been convinced by the media hype? Or is the market really going up for awhile? No one knows. Scott Redler says, “A daily close above 1220 opens the door for a quick move to 1245-1265 in the S&P” and Friday’s close was 1224.58. But Deron Wagner writes, "However, the lack of volume and overall weak internals suggests that bears may soon wrestle control of the action and that we could be headed for another leg lower” — volume seems only a little lower than average to me. The perma-bear blog Zero Hedge says the last two weeks have been a “short squeeze” postponing the inevitable and eventually there will be no more weak hands to squeeze and the market will “soar inversely”. They have a nice chart showing how the most-shorted stocks somehow find a new set of buyers every couple of days, and imply that this is caused by market manipulation, but I don’t know how much to believe in that. The market’s current behaviour is irrational, but sometimes the market behaves irrationally for months on end. This is called “climbing the wall of worry”. The pessimists refuse to trade, so the ticker shows only the optimists’ view. US news: The city of Harrisburg PA has declared bankruptcy. The #OccupyWallStreet revolution *is* being televised and this is putting the lie to all attempts by the aristocrats to incite violence and then blame it on the protesters. The protests are good news for Barack Obama, who took lots of money from Wall St. in exchange for promises to protect them from the pitchforks-and-torches crowd. Clearly they need to pay up now for another four years of protection! Euro news: Berlusconi survived his confidence vote, which was followed by rioting in the streets of Rome. On Monday a bailout was announced for Dexia Bank and the market soared, even though that was also the day when Proton Bank in Greece and Max Bank in Denmark went belly-up; after Friday’s close the Dexia bailout was rejected by the ECB, so that bank is now a zombie being kept alive by government handouts that have been ruled illegal. On October 23rd the leaders of Europe are supposed to come up with a recapitalization plan for their continent’s banks, which apparently will involve raising the fractional-reserve requirement up to 10% of loans outstanding. Some banks are threatening to sell their gold and US stocks to avoid having to raise more capital. On Friday the USA announced that it was not going to loan any more money to Europe via the IMF, but this could be just bluster. Market news: Google’s quarterly earnings were very, very good. Next week is Options Expiration week, when the Big Boys spend lots of money to prop up stock prices so they don’t have to pay off all those put-option bets they took from speculators. But if Zero Hedge is correct and the Big Boys have been having to spend lots of money this week to prevent a crash, and next week the bears will be trying harder before the options expire, can the prices stay up for another week? No one knows. If the European banks decide to sell US stocks before the October 23rd meeting, this could turn into a “bankers war” which could be entertaining for us nonbankers—but I’m not breaking out the popcorn just yet. 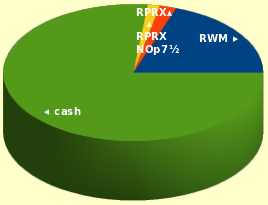 RWM: This is where 1.6% of the weekly loss came from. 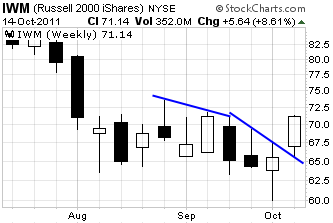 The Russell 2000 rose over 8%, so RWM fell over 8% and it is ⅕ of my account. TZA: Shouldn’t have bought this! PPO was only -0.5 and I should have waited for -1.0. Thankfully it was a small bet. TNA#2: Sold because PPO turned negative, but PPO remained near zero for the rest of the week while TNA continued upward. Anyway, I made enough on this to mostly cancel out the TZA loss. Cash: The USD fell this week. I wish there were something worth buying. In this chart of the last 14 weeks, note that a straight line can be drawn connecting three of the weekly highs and another straight line (with a sharper downward slant) can be drawn connecting three weekly highs and this week’s low. This is called “resistance becoming support” and it is a bullish sign. But it is only a sign and there is no guarantee. A chart like this can also occur due to a “false breakout” where the market jumps out of its doldrums for a week or two, then moves sharply in the opposite direction for months. There is no way to know which will happen. Dear Diary: I hope you liked last week’s annotated chart of my swing trades. I thought it was much easier to read than the daily-progress table above. I maintained that chart all week, making occasional touch-ups. I was going to show it to you — really I was! — but after Friday’s close I decided to first make this IWM chart. Although I started with a blank slate, after I clicked “Upload” the stockcharts.com program decided to overwrite my swing-trade chart with this clunker. There are no backups and no obvious way to control when an upload creates a new chart vs. overwriting an old one. It seems the stockcharts.com system is not suitable for this purpose. I could make my own charting system — it’s not a difficult PHP program to write — but I didn’t do that this week.